If you have an old car lying around the place, why not convert that ugly eyesore into cash in your pocket? We’ve all been there. The car fails its MOT, or something expensive goes pop, you get a replacement and the old one sits there on the driveway, gathering dust and cobwebs. Next thing you know, one of the tyres is flat and your front garden is in danger of looking like something out of Steptoe and Son. Typically, this happens for a number of reasons, but most commonly it is a combination of not knowing who to call to get rid of it, and not having the time to find out. Fortunately, we have the answer to the thorny issue of car disposal. And the good news is that unlike getting rid of an old fridge or washing machine, when you have to pay the council to take it away, that old motor car might even be worth some money! The question is one that has troubled drivers since the dawn of the motoring era. 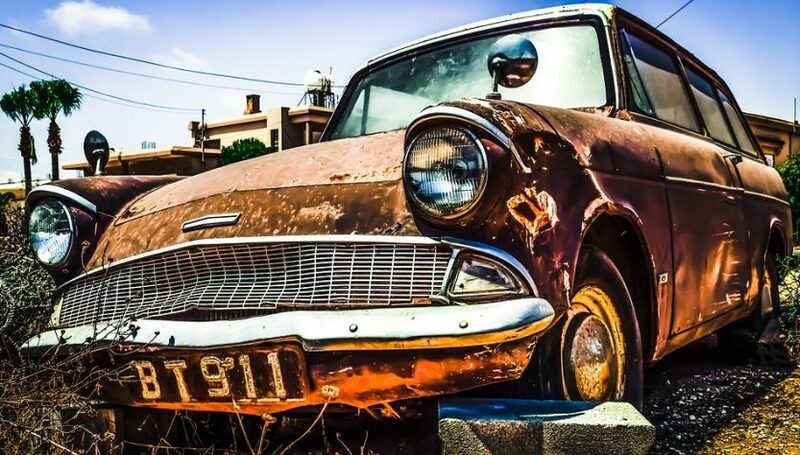 If you are of a certain age, you might remember that the sight of old cars abandoned in hedges, dumped on wasteland, set fire to in the less salubrious parts of town or even buried in gardens (no kidding!) was not uncommon. This was because the infrastructure for disposal was not as established as it is today. Here in the 21st century, when a car is no longer fit for the road, it is known as an end of life vehicle (ELV). There are strict rules governing what to do with these, to minimise the environmental impact. You really have two options. Either to sell the car privately or call in a company that specialises in disposing of scrap vehicles. Depending on what condition the car is in, someone might want to buy it from you to repair. There are numerous resources for checking the car’s value online, but bear in mind that if its MOT has expired or there is an expensive issue with it, the actual value will be a fraction of what is quoted. If the car is a non-runner, you could be getting yourself into more aggravation than it is worth. Platforms like eBay seem like a great idea for putting an old clunker up at a low start with no reserve, just to get rid of it, but you often find that the winning bidder either fails to turn up or has no idea how he’s going to transport the vehicle. You then end up stuck with the listing fees and still with an old car on your drive. All for a winning bid of about £30. These guys get rid of scrap cars for a living. There will be no messing around trying to get a non-runner started, they will simply turn up with a low loader, winch the car onto the back, fill out all the paperwork and take it away. Depending on the car, it might even be worth a few pounds – but either way, you will have it off your hands quickly and painlessly, and you will know that the components are being recycled and disposed of in the most environmentally sound way.